Google Maps for iOS just received its first update since it was released in the App Store. After his disappearance as a native iOS, Google Maps for iPhone and iPad has been a drastic improvement that all users can enjoy without going through Apple's restrictive decisions. Version 1.1 of Google Maps for iOS brings some improvements and new features such as integration with Google contacts, more efficient searches, or the ability to select miles or kilometers to show distance. Search through your Google contacts, log to display the addresses you have saved when you search for their friends and family names. Perform fast searches of selecting local places popular categories such as restaurants, bars, cafes, gas stations, etc.. Choose the drive you prefer to display distances: kilometers or miles. I must admit that since the release of Google Maps, the Maps application Apple has moved to a folder on my iPhone disaster. Both have their good things and bad things, but for me, is arguably superior Google Maps. 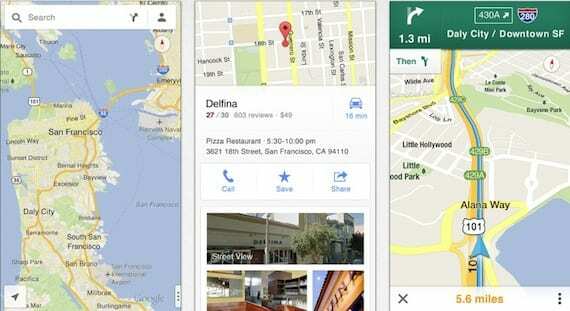 Article Google Maps for iOS gets its first update was originally published in News iPhone .